Enjoy up to 50% off a range of bedding at Dunelm including pillows, duvets, bed sheets and linen in various styles and materials. Save up to 50% on an array of stylish curtains in various patterns and colours for your bedroom, kid's room and living room. Save up to 50% off all kinds of rugs at Dunelm including shaggy rugs, wool rugs and patterned rugs in an array of different colours. Where do I use my Dunelm voucher code? Copy the code of your choice at NetVoucherCodes before clicking through to dunelm.com. Select what you would like to purchase and add them to your basket when you are ready to checkout click on the basket icon in the top right of the navigation. Review your products and enter your Dunelm Mill voucher code into the box just below your order summary. Click ‘apply voucher’ and your discount will be applied to your order. Select a delivery option and continue with the order by choosing a store for collection or entering your delivery address before you continue with the transaction. The Dunelm Mill philosophy of ‘simply value for money’ influences the fantastic quality and incomparable value of everything they sell, from rugs and lighting to mirrors and blinds, with furnishings and items for the whole home. Bedding, furniture, cushions, and curtains - you’ll find everything you’d need to make your house a home. 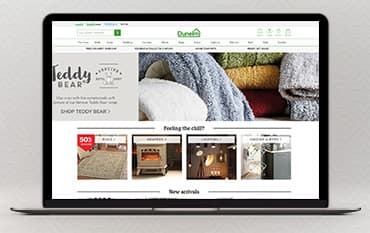 There’s free delivery on orders over £75, and a 28-day return policy, so you can simply send back your order if you don’t absolutely love it - so grab a Dunelm Mill voucher code from our website and head over to Dunhelm to find something to suit you. The Dunelm Sale is a great opportunity to grab all the best furniture and decor for your whole house at cheap, affordable prices. With regular sales and constant discounts at Dunelm, there's also a chance to save. And you can do so, on a variety of products including furniture, curtains and blinds, bedding, rugs and decor, lighting, bathroom products and cooking and dining appliances and accessories. There are even reductions on the huge range of useful utility items that everyone needs in their home. Check out the Dunelm sale now and save money on your next order. Furniture makes your house truly your own. With furniture, you add your own unique and authentic style that transforms your house into a home. Dunelm knows this and therefore ensures that they supply and sell every single item of furniture you could ever want and need, all in individual styles, colours, and patterns, so every taste and budget is accounted for. At Dunelm, you can shop for furniture via collection, room or finish. You can find everything from beds to sideboards, book cases to footstools. Dunelm furniture isn't just high quality and diverse, it's also affordable too. With regular sales and discounts, here you can find furniture for less, making the process of kitting out your home easier and more exciting! Get more Delivery Cost and Information Details on the Dunelm delivery page. Dunelm understands that you may want to return or exchange your item and you may do so within 28 days of your purchase. The items will need to be unused and in their original packaging. For transaction made using Credit or Debit Cards, the cardholder must be present. For more returns info, check here. Find the opening and closing times to your local Dunelm Store by finding your nearest Dunelm using the Store Locator tool here. Dunelm is UK chain of homeware stores selling bedding, linen, curtains, blinds, furniture, rugs and more. Use one of our Dunelm Voucher Codes for a great saving on items for your home. If you are looking for some inspiration you can shop by room and browse beautifully crafted furniture, bedding, seating, storage and the finishing touches for your dream home. There is a wide range of offer - furniture, curtains & blinds, bedding, rugs & decor, lighting, cooking, dining and so much more. We are constantly on the hunt for first order Voucher Codes for Dunelm to help you with your money saving. Our experts check dozens of sites for secret codes including NHS discounts, student sites & social media channels saving you time & money!